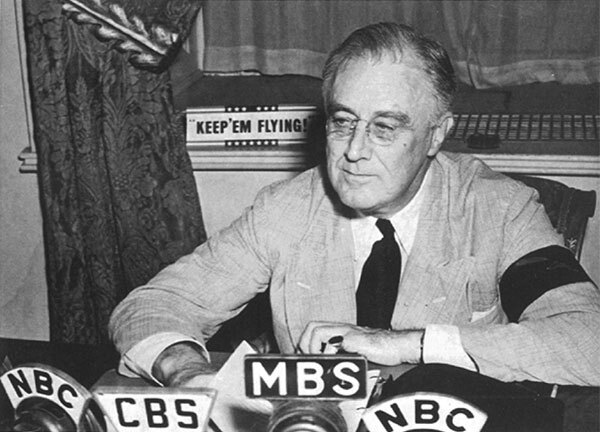 In response to the rising tension in international politics during the 1930s, the United States began moving from a peacetime status to a state of increased military preparedness, despite a strong current of isolationist sentiment. But it was not until 1940, when Germany invaded Scandinavia, France, and the Low Countries, that the U.S. Congress finally authorized a two ocean navy and an accompanying naval building program. 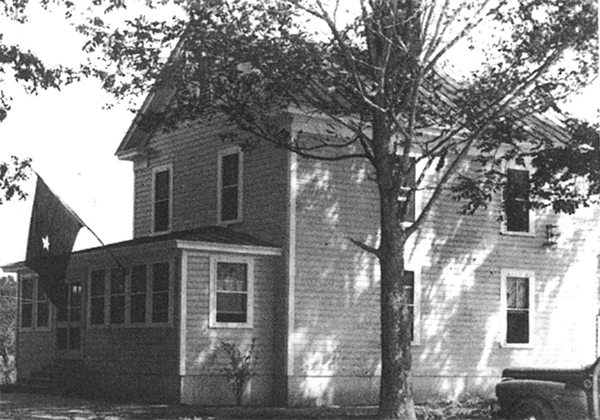 Henry Weil’s Lodge at French Creek. 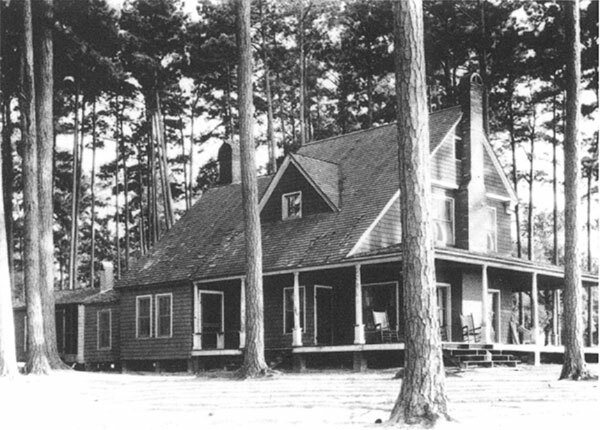 Hunting and fishing camps developed throughout Onslow County during the late nineteenth century. Some wealthy visitors, such as Weil, established seasonal homes in the county. 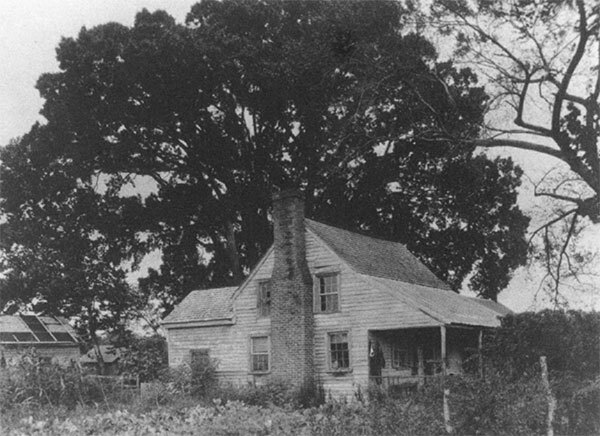 The Pearson House, formerly located near the town of Marines, was a typical example of the homesteads located in the area taken over for the development of the Marine Barracks. In the summer of 1940 then Major General Thomas Holcomb, Marine Corps Commandant, ordered Major John C. McQueen to “select a pilot . . . get a plane . . . and find us a training center.” Within a month, McQueen and his pilot, Captain Verne McCaul, embarked on an aerial survey that would ultimately cover the Atlantic and Gulf coasts from Norfolk, Virginia, to Corpus Christi, Texas. As they circled over the Onslow County coast, they saw below them 14 miles of undeveloped beach interrupted only by Brown’s inlet. It was an ideal area for training, maneuvering large formations, artillery firing, and the construction of a major facility. November 1941 land clearing activities in the area of the “airport,” Peterfield Point. The Gurganus Farmhouse, located in the Tent Camp are, was converted for use as the first base headquarters. It was later used as the headquarters for the 1st MarDiv. Sgt. Gilbert “Hashmark” Johnson looking over new recruits at Montford Point, 1943. During the latter part of April 1941 the first Marines began arriving in the area. Arriving with them was Quartermaster Clerk (equivalent to today’s warrant officer) Hubert G. Bozarth, a highly competent and resourceful young officer who would devote half of his career to the construction and maintenance of the New River base. 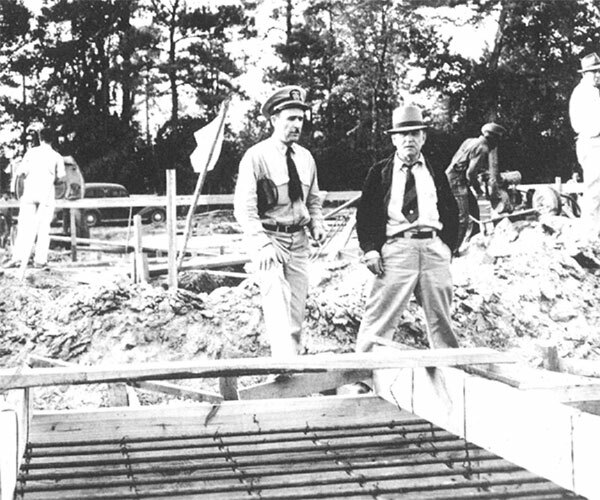 Following the attack on Pearl Harbor and the United States’ entry into World War II, the already remarkable pace of construction at Camp Lejeune was increased (Watson 1995:134). By the end of the war, the base was the most modern of its kind in the nation. 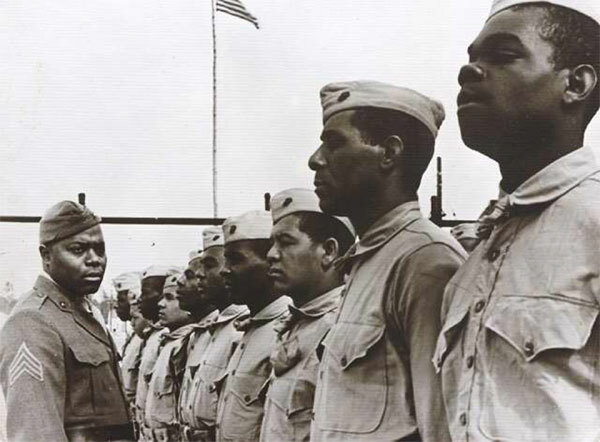 After President Franklin D. Roosevelt issued Executive Order 8802 barring discrimination in defense programs in 1941, the first African American troops arrived to train at the Montford Point area of Camp Lejeune (Carraway 1946:51). Women were trained at the base in nearly all facets of the military (except combat) beginning in 1943 (Watson 1995:135). The camp hospital was completed in the same year. There was also a dog training school where hundreds of canines were prepared for war duty (Carraway 1946:35-36). Recreational facilities were expanded midway through the war and included nine movie theaters, a stadium, and a 36-hole golf course (Carraway 1946:23-27). At the end of the war, the base had stocked fish ponds, a bird sanctuary, and recreational beachfront (Carraway 1946:31-37). The Construction Officer inspects the progress of buildings at Marine Barracks New River. The initial construction at the Marine Barracks New River occurred in four phases from early 1941 through the end of 1943. During the first phase, April 1941 to September 1942, construction in all of the principal areas of the base was completed or begun, with the exception of the Beach Area. The completed areas included Tent Camp No. 1; the Division Training Area, which housed the regiments; and the naval hospital at Hadnot Point. The second phase of construction, from October 1942 to March 1943, called for additional contracts totaling about $1.5 million to complete roads, piers, athletic fields and recreational facilities, plus dredging portions of the New River. The third phase of construction, from March to September 1943, totaled $5.6 million and provided accommodations for the Women’s Reserves (WR); expanded facilities at Montford Point, the separate training and housing facilities for the African-American Marines (Camps Nos. 2, 2A, and 3); and erected a segregated cantonment for African-American Marines at the Rifle Range, as well as a cantonment for the “Colored Labor” Battalion planned to be assigned to the Supply and Industrial Area, located east of the regimental areas along Holcomb Boulevard. This phase also featured construction of 30 “school buildings,” mostly long one story clay tile buildings clad with stucco and trimmed with brick, in the Division Training Area at Hadnot Point and at the Rifle Range, located in the southwestern portion of the base at Stones Bay. The fourth and final phase of the initial base construction, which extended through the last three months of 1943, provided a variety of utilities installations, erection of the three training pools, and a small cantonment for the Signal School at the Beach Area. The Signal School facilities consisted of three barracks, a mess hall, two school buildings, and a central heating plant. By the end of 1943 the majority of World War II construction at Camp Lejeune, both temporary and permanent, was finished. The base had been planned from the beginning with an eye to long-term use, and much of the construction was completed as originally planned. 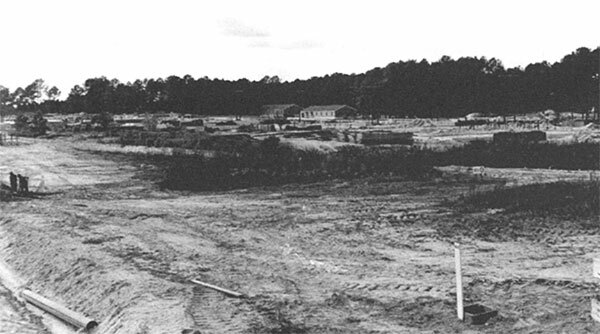 Additions to the original layout raised the capacity of the East Coast Training Center to approximately 42,000 Marines, but because the preponderance of Corps activity was on the West Coast, Camp Lejeune did not reach its capacity until August 1945, after hostilities had ceased. Nevertheless, thousands of Marines received all or part of their training at Camp Lejeune, and the base lived up to its billing as the most complete Marine Corps training base ever built. Following the war, Camp Lejeune continued as a training and support center for the Fleet Marine Force (FMF) and other units, and continued to grow. Many of the temporary structures were replaced by permanent buildings, and the years immediately after the war were characterized by the construction of new quarters, streets, and utilities (Darden 1985:70). This growth pattern continued through the late twentieth century, and culminated in 1992 with the acquisition of an additional 41,000 acres west of U.S. Route 17, an area known as the Greater Sandy Run Area (GSRA) (Berger 2006: 81). By the early 1990s the base boasted a population of approximately 110,000 (including non-military personnel), an area of over 152,000 acres, and over 7,650 structures (Berger 2006: 80). 1946 Camp Lejeune Leathernecks. Owen G. Dunn Company, New Bern, NC. 1985 Camp Lejeune. In United States Navy and Marine Corps Bases, Domestic, P.E. Coletta and K. J. Bauer, eds. Greenwood Press, Westport. Pp. 67-71. 2006 Semper Fidelis: A Brief History of Onslow County, North Carolina, and Marine Corps Base, Camp Lejeune.United States Marine Corps. 1941a Thousands Flock Here As Marine Base Begins. . Jacksonville, NC. On file at the Onslow County Museum, Richlands, FL. 1941b Marine Base Occupants Must Move; No Extension. Jacksonville, NC. On file at the Onslow County Museum, Richlands, FL. 1941c Oct. 1st New Deadline to Evacuate Marine Base. 22 August 1941. Jacksonville, NC. On file at the Onslow County Museum, Richlands, FL. 1941d More Checks Received for Marine Base Property. 17 June 1941. Jacksonville, NC. On file at the Onslow County Museum, Richlands, FL. 1941e Barden to be Present at Mass Meet Monday. Jacksonville, NC. On file at the Onslow County Museum, Richlands, FL.